At Samsung Mobile Unpacked in Berlin, Samsung has just revealed the long awaited, the rumored, the latest device in its Galaxy Note line, the Galaxy Note 2! The Note 2 is the widely-anticipated successor to last year’s original Galaxy Note, and Samsung’s improved upon that device with souped-up internals, re-vamped software and a brand new design. The Galaxy Note 2 sports a 9.4mm thin chassis with a 5.5-inch 16:9 display at 1280×720 resolution. 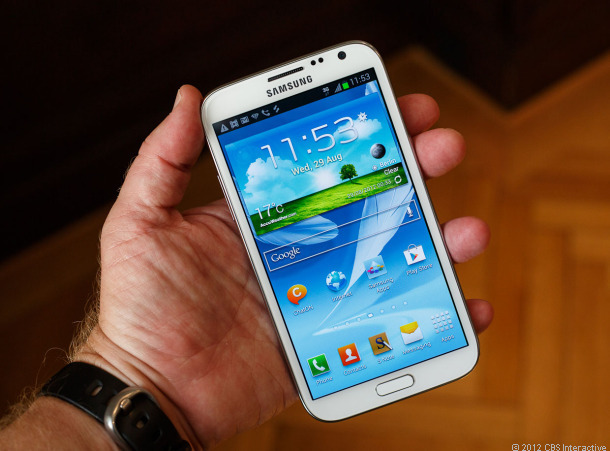 The screen itself is an HD SuperAMOLED panel, similar to what Samsung’s included on the Galaxy S3. Visually the Galaxy Note is similar to the Galaxy S 3. The home button, the rear of the phone, the overall shape all strike a resemblance to the smaller sibling. Like its predecessor, the Note 2 sports a Wacom-based pressure-sensitive “S Pen,” which has been redesigned. The pen is now taller and thicker, the button on the side now has texture to it, and it has a rubber tip which creates a subtly different action on the screen. On the inside, the Galaxy Note 2 is powered by a 1.6GHz Exynos 4 Quad CPU — the same CPU found inside the S3, only at a higher frequency. That’s backed up by 2GB of RAM and 16,32, and 64GB of storage. Samsung will offer the device in both 3G/HSPA and 4G LTE flavors, though for the moment there’s no info on which version will be offered in which markets. On the software side, there’s Android 4.1.1 Jelly Bean, backed up by Samsung’s TouchWiz Nature UX. And like the original Note, pen-centric apps like S Note have been included to take advantage of the new Note’s unique hardware.